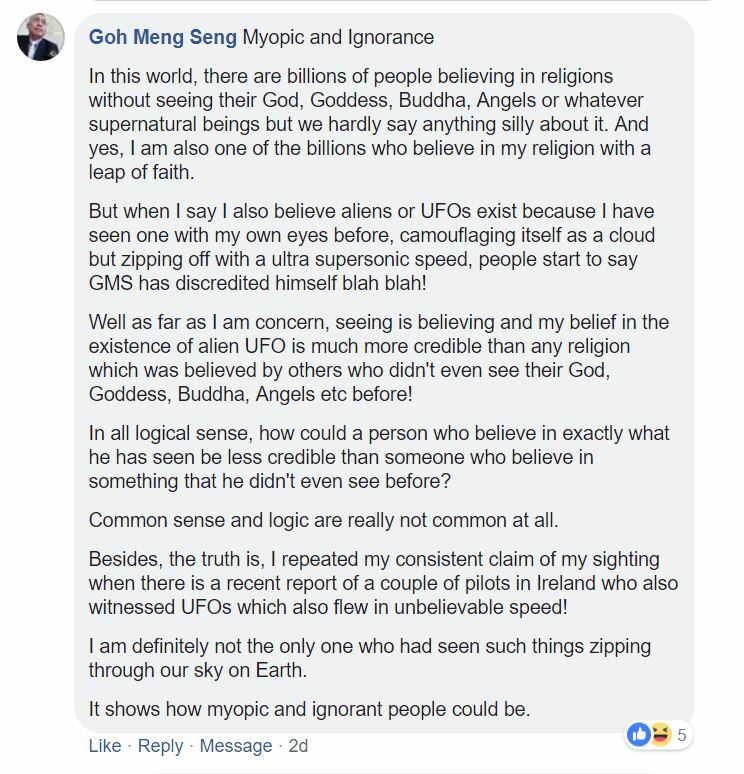 People’s Power Party secretary-general Goh Meng Seng has hit out at detractors who have flamed him online, after he asserted on social media that he has seen a UFO and that he believes in aliens. Last week, Goh wrote on Facebook: “Back in 2000, I have seen an object masquerading as a cloud which was glowing and floating at a very slow speed. Before I could take out my camera to take a picture of it, it just zoomed away in extreme speed…astronomical speed, zipping through the evening sky. “In this world, there are billions of people believing in religions without seeing their God, Goddess, Buddha, Angels or whatever supernatural beings but we hardly say anything silly about it. And yes, I am also one of the billions who believe in my religion with a leap of faith. “But when I say I also believe aliens or UFOs exist because I have seen one with my own eyes before, camouflaging itself as a cloud but zipping off with a ultra supersonic speed, people start to say GMS has discredited himself blah blah! “Well as far as I am concern, seeing is believing and my belief in the existence of alien UFO is much more credible than any religion which was believed by others who didn’t even see their God, Goddess, Buddha, Angels etc before! “In all logical sense, how could a person who believe in exactly what he has seen be less credible than someone who believe in something that he didn’t even see before? “Common sense and logic are really not common at all. “Besides, the truth is, I repeated my consistent claim of my sighting when there is a recent report of a couple of pilots in Ireland who also witnessed UFOs which also flew in unbelievable speed! “I am definitely not the only one who had seen such things zipping through our sky on Earth. “Ok, I shall tell you why I am UFO/alien believer. “I have witnessed what I believe to be an UFO, an alien object back in 1999 because no human technology can explain or did what that object did. I have written about it back then on soc.culture.sg. “At a glance, it looks like a glowing white cloud floating in the air. It was oval in shape. It was floating just outside my windows. I was watching TV at that time. “It caught my eyes because of its “glowing” nature and the way it moved, in a slow and steady movement which somehow looked “unnatural” to me. I tried to take a closer by moving to the window. Just a minute later, it just zipped and zoomed out of my sight within a blink of my eyes… I believe no human technology could make any object to move at such a great speed. “Such image is still imprinted in my mind deeply. Just too bad I didn’t have any video camera back then to record the whole process. From then on, I always keep an open mind about UFO sightings. Some UFO sighting reports around the world coincide with my own witnessing experience… such objects just zip and zoom out of sight within seconds. “Whether or not this news about the three gigantic spaceship is real, I really don’t know. Top travel from Earth to Pluto or Jupiter by a normal human space exploration crafts will take years… tens of years. If it takes only 2 years to reach Earth, it is already traveling at 20 times or more than human technology could do.